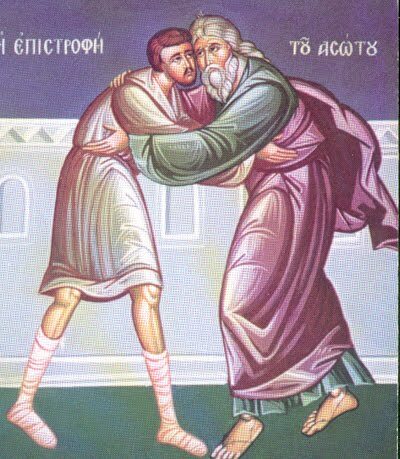 On this Sunday, we commemorate the Parable of the Prodigal Son, from the Holy Gospel, which our most Divine Fathers appointed to be read after the Parable of the Publican and Pharisee. For the door of God’s mercy hath been opened. Since there are some who are conscious of having lived prodigally from a very early age, giving themselves over to drunkenness and licentiousness and falling thereby into a depth of evils, and have reached despair, which is the offspring of vaunting; and since, for this reason, they have no desire to devote themselves to the pursuit of virtue, putting forward the swarm of their evils as an excuse, and since they are forever falling into the same evils and worse than these, the Holy Fathers, wishing, in their paternal loving-kindness towards such people, to lead them away from despair, placed this parable here after the first one, pulling out the passion of despair root and branch and arousing them to acquire virtue, and, through the story of the Prodigal Son, showing God’s loving and exceedingly good mercies towards those who have sinned very greatly, proving from this parable of Christ’s that there is no sin which can overcome His love for mankind. The man, that is, the Theanthropic Word, had two sons, the righteous and the sinners. 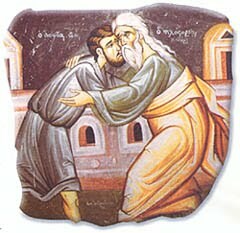 The older of the two always abode by the commandments of God and adhered to what was good, and did not become estranged from Him in any way; but the younger one, who craved sin and rejected fellowship with God through his shameful deeds, frittered away God’s loving-kindness towards him and lived a prodigal way of life, since he did not preserve intact the image of God in himself, but followed after an evil demon, enslaved through pleasures to his evil volitions and unable to fulfill his own desire. For sin is something insatiable, habitually beguiling us through that which affords temporary pleasure; the parable likens this to the husks, the food of pigs, for husks initially taste sweet, but later feel rough and chaffy, which is always the case with sin. 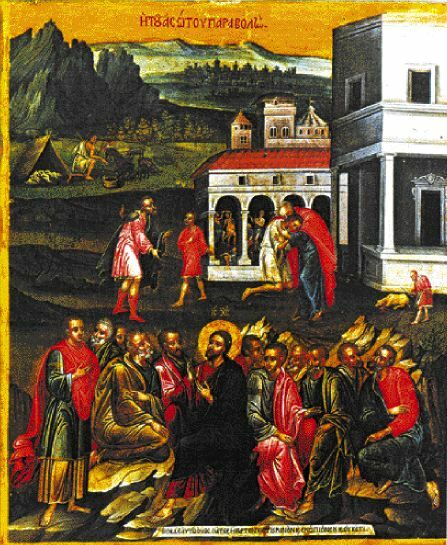 As soon as the Prodigal Son came to himself, perishing as he was from a deficit of virtue, he went to his Father, saying: “Father, I have sinned against Heaven, and before thee, and am no more worthy to be called thy son.” The Father received him in repentance, not chiding him, but embracing him, showing His Divine and paternal compassion; and He gave him a robe, that is, Holy Baptism, and a ring, that is, a seal and a pledge, the Grace of the All-Holy Spirit; in addition to this, He gave him shoes, so that his godly footsteps might no longer be wounded by serpents and scorpions, but rather, that he might be able to crush their heads. Thereafter, in His exceeding joy, the Father sacrificed the fatted calf for him, His Only-Begotten Son, granting him to partake of His Flesh and Blood. And yet, the elder son, marvelling at His boundless compassion, said all that he said in the parable. But the loving Father calmly restrained him with kind and gentle words: “Son, thou art ever with me, and it was meet for thee to make merry with thy Father, and be glad: for this my son was formerly dead in sin, and is alive again, after repenting of his wicked deeds; having been lost and become estranged from me by his life of pleasure, he was found again through me, for I felt compassion and called him back by my sympathetic disposition.” This parable can also be interpreted in terms of the Hebrew people and ourselves. This is why this parable was placed here by the Holy Fathers: it uproots despair, as we have said, and faintheartedness in performing good deeds, and exhorts one who has sinned as the Prodigal Son to repentance and remorse. This is our greatest weapon for warding off the darts of the Enemy, and a strong defense. By Thine ineffable love for mankind, O Christ our God, have mercy on us. Amen.